In 1839, a traveler and journalist Marquis de Custine was invited to the court to Peterhof. In an interview with him, Empress Alexandra Feodorovna complained: "Peterhof's life is unbearable for me, and I asked the Emperor to build some hut where the eyes could rest from all this massive gilding." It was about the Palace "Cottage" in Alexandria. We tell how the request of the Empress opened a new page in the country life of the XIX century. The owners of the territory where the Park of Alexandria is located, at first changed with unimaginable frequency, until in 1725 it was bought by Alexander Menshikov. He began to build a Palace "Mancora" — "My courage", but the construction never finished. When Menshikov fell into disgrace, the land passed to the Empress Anna Ivanovna. With her in Alexandria appeared " Ohotnichiy Park" and into the territory failed "My courage" was populated by deer, wild boars and even tigers. However, the official Tsar's summer residence was chosen Tsarskoye Selo, the Park was abandoned, and only ruins remained from the Menshikov project. It was in this form that the estate was given to Nikolay I. the newly-Made Emperor gave it to his wife Alexandra Feodorovna, and the residence was called "her Majesty's own dacha Alexandria". "...Build on the site where the Menshikov ruin, a rural house, or the so-called "kotich" with all economic institutions, with the addition of the Park." In 1826, Nikolay I commissioned the construction of the architect Adam Menelas. Alexandra was a sentimental lady and loved chivalrous novels — and with the light hand of the poet Vasily Zhukovsky, Alexandria had its own coat of arms: a blade piercing a wreath of white roses, on a blue background. This coat of arms can still be found on the buildings in the Park. 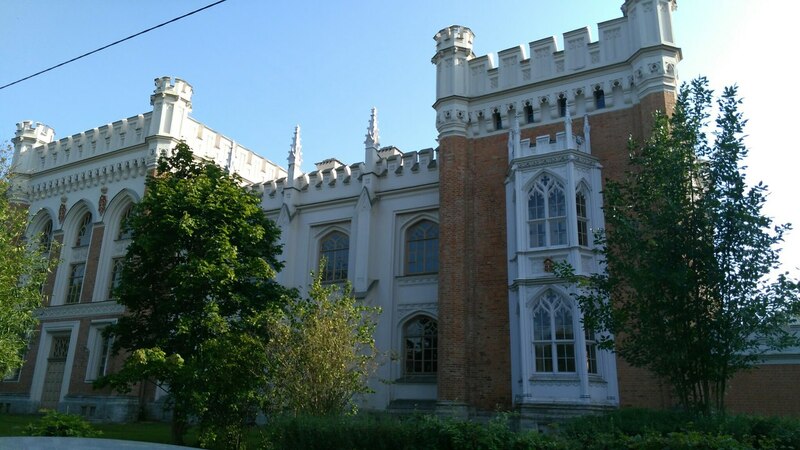 The Cottage Palace followed two trends: it was built in the spirit of the then fashionable Gothic revival and at the same time was homely, unlike the neighboring pompous buildings of Peterhof. While Adam Menelas built the Palace, garden master Peter Erler was engaged in the formation of the garden and Park ensemble, which took almost 20 years to create. Almost man-made Park with an area of 115 hectares on the shore of the Gulf of Finland was decorated with neo — Gothic buildings — wells, gazebos, Ruins bridge-in the best traditions of Russian romanticism. In 1834, the construction of the house Church was completed — of course, also in the Gothic style. To make" her Majesty's dacha "even more like an idyllic sketch from a sentimental play, Menelas built a dairy farm near the Cottage with a pavilion"in rural taste". The architectural baton was taken by Andrey stackenshneider: for 20 years (Alexandria, as Moscow, "was not built immediately") he rebuilt this pavilion until he turned it into the Fermerskiy Palace of Alexander II. The Palace, which the Emperor considered his second home, was equipped with the latest technology. For example, it was here that the first Elevator in Russia appeared, which, however, was driven by the old — fashioned way-manually. The Royal family lived in Alexandria quite alone, resting from the Protocol and the clouds of curious servants. Men carrying buckets were replaced by mechanisms that raised water in the bathrooms. Hot and cold running water, shower and toilet appeared in the Palace. Of the servants of the house remained one of the cameras-and Mrs. a laundress. There was not even chef — kitchen made in a separate outbuilding. Peterhof holidays were to the taste of the Imperial family, and around the ready-made palaces began to grow, as they would now say, an elite cottage village. Through the efforts of Stackenschneider were built a New farm, the building of the Palace Telegraph station, Konstantinovsky (aka Admiral's) house. Later, the project of architect Antony Tomishko on the shore of the Gulf of Finland built "Nizhniy cottage" for Nicholas II, which, unfortunately, has not survived to the present day. Nikolay I can be called the main summer resident of the Russian Empire (the first was Peter the Great). The Emperor conceived Alexandria as an oasis of calm and family rest, and therefore ordered to build a whole entertainment complex for children on its territory: a sports ground, a children's fortress under the laws of this fortification, a children's fire tower, a rural house and a farm with a water mill, a pigeon — house and other facilities. Alexandria turned out to be a unique case: not Russia wanted to live like Peterhof, but Peterhof — like all Russia. Country life of "ordinary people" became a dream of the Imperial family. Alexander III, for example, also preferred to live in a Cottage. His daughter, Princess Olga, remembered how the autocrat father quietly early in the morning, so as not to Wake up the household, took a basket and went to the forest for mushrooms. And then he worked-from St. Petersburg came to the audience, brought important papers. In General, the life of the Royal family in those days was not very different from the current classical pastime on the "six hundred", except for the solution of issues of national scale. In Alexandria they spent the summer, fished, went hunting, rode bikes, walked a lot, played ball, picked berries. After the Romanovs in the vicinity of Peterhof began to move in high society: at first, the aristocrats and entourage, then the officers, different ranks of the intelligentsia, wealthy citizens. In 1832, Nikolay I issued a decree allowing to buy plots in Peterhof for cottages. However, to build a country house in Peterhof was worth a lot of effort because of the cumbersome bureaucratic scheme. First of all, it was necessary to collect documents, then — to apply to the Palace administration, from where it came to the Emperor personally. His Majesty considered the application and decided whether to start construction. In addition, it was necessary to specify the name of the architect, and the architect, in turn, had to have a diploma. The second way to spend the summer in Peterhof was easier-to rent a ready dacha. Of the great Russian writers of his house near Peterhof was not anyone, but all lived there, rented a house or stayed. To rent a cottage near the Imperial residence cost a lot of money. As the literary critic Boris Averin told, " if a person in the society said that he took a dacha in Peterhof, it was like "I got a Vice-Admiral." The cottages served as homes with certainly a glassed-in veranda. The most chic were colored glass, a kind of stained glass in the country. On the verandas reading stories, telling stories, drinking with the guests tea. 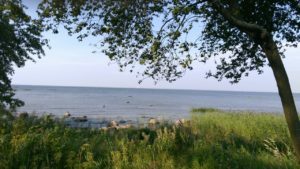 Cottages were inextricably linked with dancing, music, cozy evenings, outdoor games, picnics, swimming in the Gulf of Finland and new acquaintances: as a rule, every summer inveterate summer residents rented houses in a new place — and there are new friends, and even novels. They staged home theater performances in Peterhof residences, where all the neighbors were invited. Alexander Blok, for example, and his future wife Lyubov Mendeleev successfully played hamlet and Ophelia. Another popular hobby of the beginning of the century was the "magic lantern" — the predecessor of the movie camera-which was going to see the history in the pictures. It was under the influence of Alexandria that the very culture of the Russian dacha was born. In the literature there was a whole system of country images and motifs, because the writers and poets who spent the summer in the vicinity of Peterhof from friends or rented a house there, you can list in alphabetical order: Alexander Block, Peter Vyazemsky, Ivan Goncharov and so on. 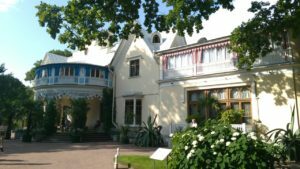 In the summer months, almost all the creative elite moved to the dacha: Anton Rubinstein, Pyotr Tchaikovsky, Mikhail Vrubel, John Aivazovsky and many others were avid gardeners. The idyll of country life during the Soviet period was subjected to serious tests. In the building of the Fermerskiy Palace has created a recreation center of Leningrad Soviet, at the Bottom of the country — the rest house of the NKVD. During the great Patriotic war, half of the exhibits of Alexandria managed to evacuate, but the architecture was less fortunate. The cottage and the farmhouse were badly damaged. In the latter — according to the Soviet tradition, to use any space for the benefit of socialism under construction-there was a hostel of Petrodvorets watch factory. The lower the country in the 1960-ies and is recognized unsuitable for restoration and was demolished. But thanks to the work of talented restorers today the Park fully reflects the idea of its Creator — Nicholas I, who wanted to "be here only the husband of the Peterhof landowner." Restored Cottage, Fermerskiy Palace, the Gothic chapel, the Ruin of the bridge, Courier house, the Palace Telegraph station. And still behind the fence of pompous Verhniy and Nizhniy parks of Peterhof lives a quiet and measured life of the island of family country comfort-Alexandria.